If the aim is sustained change, how can we justify programs that produce only short term changes in behaviour? Take industrial safety. Terrible rates of death and injury at work in the early twentieth century were not tamed by persuasion, but by a constellation of permanent institutional, technological and system changes that included Occupational Health and Safety Committees, the WorkCover inspectorate, and a massive system of legislated safety standards that drove tremendous innovations in the design of machinery and workplaces. Do the challenges we now face deserve any less attention? It’s true that one-off actions like signing up, coming along or trialing a new behaviour are vital elements of any change program. So short term behaviour change methods like those popularised by Robert Cialdini in Influence and Yes! 50 Scientifically Proven Ways to be Persuasive  are vital too. But for long term change to occur, the purpose of these methods, and their legacy, should be sustained changes to the environments in which people make their choices, a.k.a. “systemic changes”. So, a program to get people cycling should also contribute to the creation of safe bicycle routes. A program to reduce household energy use should lower price barriers to technologies like draft proofing and smart meters. A program that asks people to leave their cars at home should also increase access to safe, rapid public transport. And so on. System changes are hard work compared to designing web sites and phone apps, but they have fantastic advantages of efficiency – once systemic changes are in place, they affect everyone, and their impact continues indefinitely with little additional effort. I want to propose a principle. Every behaviour change program should contribute to sustained changes to the environment in which people make choices. 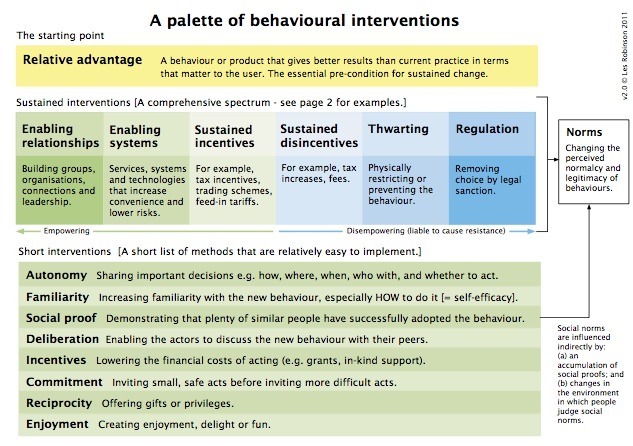 Download an A4 version of the Palette of Behavioural Interventions (41k PDF).